AFA Census: Who is AFA today? Who is AFA today? It’s you. But what does that mean? We have heard from many members who want our union to know what’s important to them, the responsibilities they have at home, and even their personal political affiliations. We can be more effective at the bargaining table, fighting for laws and regulations that support our work, and encouraging involvement from every demographic of our union when we better identify who the members of AFA are today. Yes, we have more in common than anything that could ever divide us. But how do we use our diversity to strengthen our work as a union and achieve the results that matter to you? These are the questions and the motivation that led your locally elected leaders to vote to conduct a Census of AFA members. 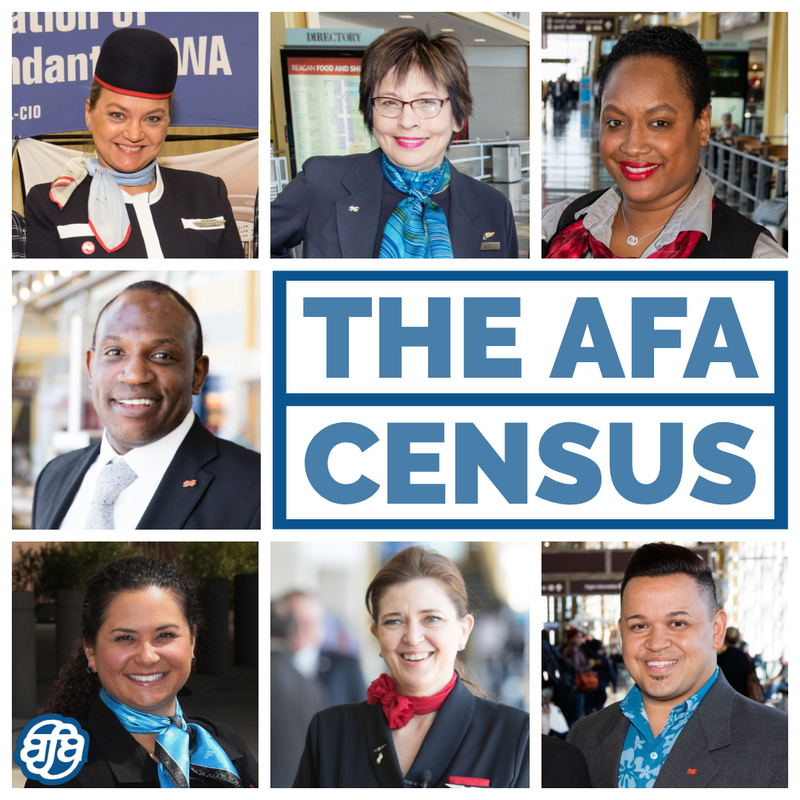 The Association of Flight Attendants-CWA 2019 Census is a project to better understand the demographic make-up of our union, including your aspirations, needs, and preferences. We also want to know in what areas of your community you may already be engaged in making a difference for you, your family, and the place where you live. All of this will help us build power together so we can continue to advance our Flight Attendant careers. The University of New Hampshire Survey Center (UNHSC) is conducting this very important data gathering effort. You will be receiving an email and possibly a phone call in the next week to encourage you to complete the Census. Once you complete the Census, you will not be contacted by UNHSC further. Our contract with UNHSC ensures your information remains confidential within AFA. It does not allow UNHSC to share any of your information with outside organizations. A summary of the final results will be shared with AFA members. The questions on the census should take you no more than 15 minutes to complete. Please look for an email from "Sara Nelson via UNH" with the subject line "AFA Census – Response Requested." We look forward to learning more about the AFA of today!